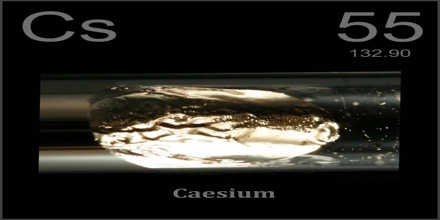 Caesium is a soft, ductile, silvery-white element of the alkali group. It is liquid at room temperature and is the most reactive of all metals. It is a chemical element with symbol Cs and its atomic number 55; atomic weight 132.905; melting point 28.5°C; boiling point 690°C; specific gravity 1.87; valence 1. 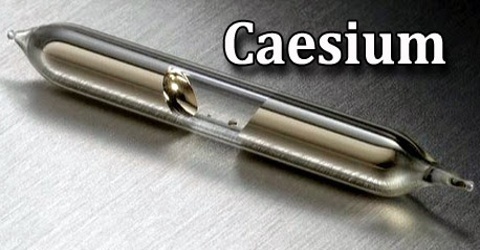 Caesium has physical and chemical properties similar to those of rubidium and potassium. Caesium is the alkali metal just below potassium on the periodic table. It is the least electronegative element, with a value of 0.79 on the Pauling scale. It has only one stable isotope, caesium-133. It is used to make photoelectric cells, electron tubes, and atomic clocks. Caesium was eventually discovered by Gustav Kirchhoff and Robert Bunsen in 1860 at Heidelberg, Germany. They examined mineral water from Durkheim and observed lines in the spectrum which they did not recognise, and that meant a new element was present. They produced around 7 grams of caesium chloride from this source, but were unable to produce a sample of the new metal itself. The credit for that goes to Carl Theodor Setterberg at the University of Bonn who obtained it by the electrolysis of molten caesium cyanide, CsCN. Cesium Cs 137 is prevalent due to its spontaneous production, which occurs as a result of nuclear fission of other radioactive materials, such as uranium and plutonium. This radionuclide has a relatively long half-life, 30 years, and decays by emitting beta particles. Mining and refining pollucite ore is a selective process and is conducted on a smaller scale than for most other metals. The ore is crushed, hand-sorted, but not usually concentrated, and then ground. 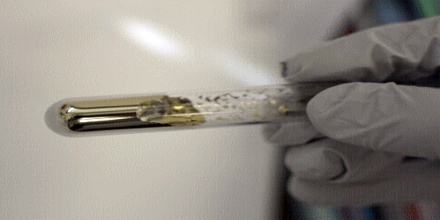 Caesium is then extracted from pollucite primarily by three methods: acid digestion, alkaline decomposition, and direct reduction. Most of the mined caesium (as salts) is directly converted into caesium formate (HCOO−Cs+) for applications such as oil drilling. To supply the developing market, Cabot Corporation built a production plant in 1997 at the Tanco mine near Bernic Lake in Manitoba, with a capacity of 12,000 barrels (1,900 m3) per year of caesium formate solution. The primary smaller-scale commercial compounds of caesium are caesium chloride and nitrate. Cesium is classified as an “Alkali Metal” and located in Group 1 elements of the Periodic Table. An Element classified as an Alkali Metal is a very reactive metal that does not occur freely in nature. Alkali metals are soft, malleable, ductile, and are good conductors of heat and electricity. It is found in the mineral pollux, or pollucite, which occurs on the island of Elba, in South Africa, in the United States in Maine and South Dakota, and in Manitoba, Canada. The most common use for caesium compounds is as a drilling fluid. They are also used to make special optical glass, as a catalyst promoter, in vacuum tubes and in radiation monitoring equipment. One of its most important uses is in the ‘caesium clock’ (atomic clock). These clocks are a vital part of the internetand mobile phone networks, as well as Global Positioning System (GPS) satellites. They give the standard measure of time: the electron resonance frequency of the caesium atom is 9,192,631,770 cycles per second. 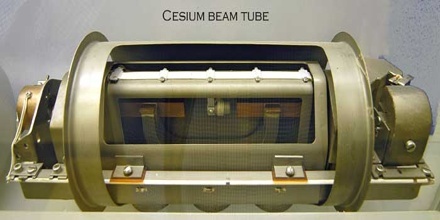 Some caesium clocks are accurate to 1 second in 15 million years. Reference: elementalmatter.info, rsc.org, dictionary.com, wikipedia.